This book looks at the interplay between people, land and sea. South of the Strzelecki Ranges is the story of the South Gippsland coast and the people whose lives were intertwined with the sea, rivers and swamps of Corner Inlet. The Brataualung of the Gunaikurnai, the traditional custodians of the coastal lands of the inlet, lived in this rich estuarine landscape on the fringe of the great forests. 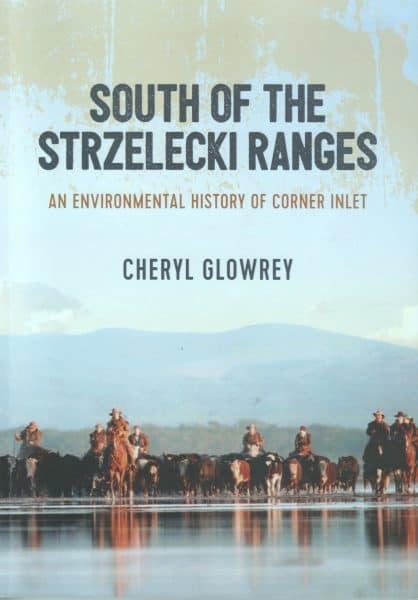 South of the Strzelecki traces the story of a changing landscape and marine environment as new settlers overcame the challenges of weather, shallow waters, forests and wetlands to build European farming and fishing industries. As the millennium arrived, conflicts over marine conservation and renewable energy forged a new identity for the local communities of Corner Inlet. On February 5 2019 Cheryl gave an entertaining account of how she approached writing this book, which is based on her doctoral thesis. Members can listen to the talk by emailing the secretary at enquiries@promcountryhistory.org.au and arranging a time to visit the museum. A brief introductory clip is attached. Click RED ARROW to listen. preferably using headphones. We acknowledge the traditional custodians of the lands and waters on which the information displayed in the Foster Museum is based, the Gunaikurnai and Bunurong peoples, and pay our respects to their elders past, present and emerging. We also pay our respects to Indigenous elders and peoples who are visiting from other First Nations places.